*Price is based on a family travelling to France for 8 days. Cover constitutes two adults or legal guardians (under 66 years) travelling with unlimited dependent children (including adopted and foster children, and grandchildren) plus other children (single trip), under 18 years at departure, in full time education. Children under the age of 3 MUST be accompanied by parents. Children must travel with one of the insured adults. Policy terms, limitations and excesses apply. Prices correct as of 30/06/16. If you have kids, you know how important it is to expose them to new experiences and let their sponge-like brains soak up all the knowledge they possibly can – and what better way to do that then to take them travelling? Luckily, InsureMore has a high selection of comprehensive, flexible and cheap family travel insurance policies available. 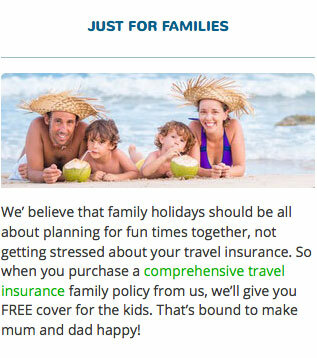 Whether you’ve been saving your pennies for Paris and can only afford one trip this year or you’re taking the brood on multiple international excursions, we’ve got family holiday insurance that’s right for you. 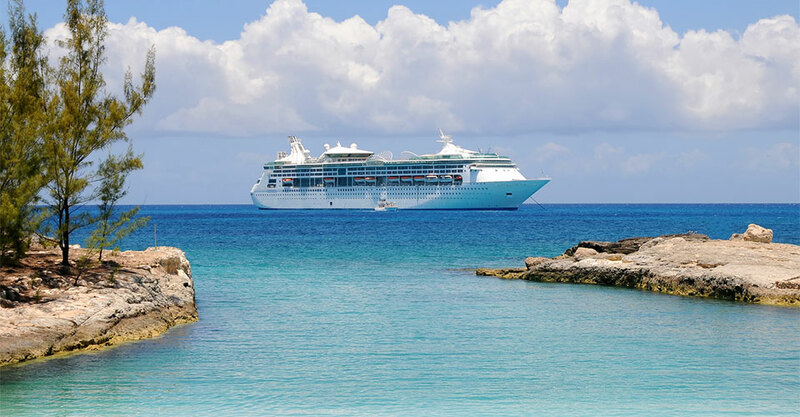 There are single trip policies for the homebodies and annual coverage for those always on the move – the added bonus of the latter is that, if you purchase it, we’ll let the kids go free! We know no two families are the same – and that means each family travel insurance policy should be personalised to meet your individual needs. Our dedicated experts are here to craft a policy with all the benefits your tribe needs and more, with free add-ons for everything from golf equipment to cruises to car hires to business trips. Want to see if you qualify? Just call up a member of our team and ask. A holiday with your closest loved ones is bound to create memories that will last a lifetime. Make sure the people you love the most are safe and sound with InsureMore’s cheap family travel insurance policies – peace of mind and protection for everyone are right at your fingertips. You’ve decided on your destination, booked your flights, picked your accommodation and got yourself some cheap family travel insurance… looks like the only thing you’ve got left to do is the p-word: Pack. Although many dread it and procrastinate and throw their suitcases out the window in frustration because the 25kg weight rule airlines have is impossible to comply with, packing for a family holiday doesn’t have to be a nightmare. We all know what you bring can make or break a trip – check out this list of dos and don’ts to help ensure the latter doesn’t happen. Do give each of your children a personal backpack. Throw in a change of clothes, a water bottle, a snack and some toys – as long as you make sure it’s not too heavy for them (because you know you’ll be the one lugging it around if it is), they’ll have lots to do on the plane ride. The spare clothes will come in if you have a spill-prone kid, plus having the backpack around will be great for long days out once you arrive at your destination. Do give your back a break and pack lightly – you probably only need to bring half of what you think you need. A good rule of thumb when it comes to packing for children is planning complete outfits. One for each day you’ll be away plus one extra in case of accidents is usually more than enough. Do bring your own sunscreen (and don’t forget to pack it in your checked bag) so you don’t have to pay an arm and a leg at some tourist spot. Do divvy up each family member’s clothes and put some in all suitcases so that if a bag is lost, everyone still has something to wear. Don’t pack medication into your checked bags. Keep it in your carry-on in case your bag gets lost. Don’t pack last minute. It just adds unnecessary stress and you’re sure to forget something – leave adequate time to pack properly. Don’t bring full-sized toiletries. Save room and keep your bags light by bringing travel-sized soap, shampoo and conditioner. Don’t pack everything into one large suitcase. You’ll be without all your belongings if your bag gets lost – plus it’s going to be exceptionally heavy to lug around. Get a couple medium-sized suitcases instead. Don’t forget to check how easy (or difficult) it is to manoeuvre your luggage. Take a stroll around the block with your packed bags to test what it’ll be like travelling abroad with them, and consider reorganising if they’re too heavy. Packing properly can alleviate an enormous portion of travel-related stress – and so can investing in appropriate and cheap family travel insurance (make sure it covers the entire family, plus any luggage and technology you bring). With all that done and dusted, you and your family can pack your stress away and unpack a world of foreign fun. For even the most experienced travellers, adding children into the mix can make it a whole new ballgame. You have to do a lot more preparation, budget much more carefully (thank God for cheap family travel insurance) and be far more aware of your surroundings once you’re actually abroad. These helpful tips and tricks will make all that planning a snap – and before you know it, you and your family will be enjoying a croissant in front of the Eiffel Tower. Before taking your child abroad, it’s a good idea to consider whether or not it’s practical to do so. Lots of parents agree that, as long as you’ve got child-friendly activities planned each day, primary school kids can be the best to travel with, while others believe kids in secondary school are the ideal age. Regardless, a good rule of thumb is that if your child has no problem with sleeping away from home, is able to withstand full days of walking and is comfortable eating whatever is placed in front of them, they are probably old enough for a holiday in Europe. The right destination can make or break a trip with children. For younger children, it’s best to pick places that offer lots of fun kid-friendly activities so they don’t get bored (e.g. playgrounds and petting zoos). They also tend to be happy with rural accommodation – as long as there’s a grassy field to run around in and a pool to swim in, they’re set. However, if your children are older (and especially if they’re teenagers), enlist their help in deciding where to go and what to do. They’ll love being a part of the decision-making process, and researching locations and things to do will make it their trip as much as yours. If you take their answers into consideration when finalizing the planning, you’re far more likely to end up with a trip everyone will love. Once you know where you’re going, introduce the country by finding some age-appropriate movies and books set in the place you’re jetting off to! Although you always want to be prepared when travelling, it’s especially important when you’re going on an international holiday with children in tow. Come up with contingency plans should there be an emergency, and go over these plans with your child. For example, if you lose each other on crowded public transportation, a good backup is reconvening at your accommodation. Give your child a business card from your hotel to carry so that they have local contact information. Many parents also invest in pay-as-you-go mobile phones for easy contact in case of emergencies. Some families even come up with a unique loud noise, like a whistle or whoop, to catch each other’s attention easily. Buy your child a journal (purchasing it abroad can make it a cool souvenir) and a disposable camera and encourage them to write about and take pictures of their trip. Make the journal important to them by suggesting they record more than just the day’s itinerary – they can include their feelings and reactions, and even paste in the photos they take! To boost their confidence, teach them a few useful phrases – with their newfound foreign language skills, the bravest among your brood may even try to strike up a conversation with one of the locals. Get everything in place before you go, especially if you’re on a budget. Your flights will be way more affordable if you book ahead of time and there are lots of great options for cheap family travel insurance that will set your mind at ease. It’s also important to pack correctly (you only need a few toys, and super bulky clothing often just takes up space) so that you don’t have the unnecessary expense of checking in that extra suitcase. An international holiday with children may seem daunting but that doesn’t mean it’s not more than doable – and it definitely doesn’t mean your trip won’t be enjoyable. Your travelling days are nowhere near over just because you’ve got some little ones running around. You just need a little more planning…and a lot more snacks! I officially dub Dublin child-friendly. ‘But Ireland and drinking are synonymous!’ you may very well say. Of course, the Irish definitely love a good Guinness, but there are more than a few activities completely suitable for children. In fact, Dublin is a great destination for families with youngsters because the flight time from England is so short. Once you’ve got your family holiday insurance and booked your flights, all you need is ideas for where to take the little ones – and have I got a list for you. Pirates Cove – Arrrr you ready for the best pirate playground in all of Ireland? Suitable for ages one to ten, the kids will love bouncing around on Palm Island or flying down the giant slide drop, while parents can kick back and relax with a coffee and a cake. Plus it’s all indoors, which means inclement weather won’t put a damper on your family’s fun. Pirates Cove even offers great birthday party packages, private sessions for children who have special needs and extra adventures, like bungee trampolines and paddle boats. Dublin Zoo – For a day out with the family that’s as stimulating and entertaining as it is educational, there’s no better place than Dublin Zoo. Adults and children alike will love learning about the animals from A(frican painted dog) to Z(ebra). Viking Splash – Ever had a tour from a Viking? If you answered ‘no,’ consider visiting Viking Splash Tours. It’s a thrilling land and water tour all in one, featuring Dublin’s main sights. Kids will love the theatrical tour guides and amphibious vehicle – and who knows, maybe they’ll learn a little something amidst all the fun and excitement. Natural History Museum – For an affordable day out, consider visiting the Natural History museum. Admission is free and it’s a great way for the kids to learn all about the natural world while having a world of fun. The museum features 10,000 amazing exhibits which they’ve nicknamed ‘The Dead Zoo’. This is a comprehensive and impressive zoological collection, ranging from native Irish animals to a popular giraffe that goes by the name of Spoticus. To make your travels flow as seamlessly as possible, it’s important to remember to pack correctly, book appropriate accommodation (not too much walking for the younger kids as they tire easily) and, of course, put a family holiday insurance policy in place. Make sure the family holiday insurance policy you choose covers all members of your family – they’re the most useful and the most affordable deals! By now you should have all the tips and tricks you need to get the kids to Dublin and make sure they have a good time – and with everything so neatly in place, you might even have a chance to indulge in one of those Guinnesses I mentioned earlier. A summer beach holiday can be a major investment when you’ve got plane tickets, accommodation and single trip travel insurance to pay for. Considering the amount of planning – and money – that goes into a holiday, you’ll want to make extra sure that your effort pays off and that you and your family have the time of your lives. That’s where a resort like Benidorm, on Spain’s Costa Brava, comes in! This resort has worked hard to earn its reputation as Spain’s most popular holiday resort on the mainland. It’s done this by making sure that it has everything its visitors could wish for in terms of activities, water sports, accommodation and, of course, beautiful Blue Flag beaches. Over the years, Benidorm has worked particularly hard to attract families, and the result is simply fabulous: there are loads of things for you and the kids to do together, ranging from theme parks and water parks to zoos and aquariums. One thing’s for sure: a family holiday in Benidorm is never going to be dull. Here are my top tips for fun activities and attractions to explore in the resort. Levante Beach is Benidorm’s most popular beach, and it’s not hard to understand why. The beach runs alongside the centre of the resort, so it’s close to the holiday accommodation. It also boasts a great, family-friendly promenade, featuring everything from shops selling buckets and spades to cafés serving cold drinks and ice cream. On the Blue Flag beach itself, you’ll be able to rent sun beds and umbrellas – why not spend the day with the kids playing in the sand and taking regular dips in the beautiful Mediterranean? For a break from the beach, it’s well worth spending a day at the Terra Mitica Theme Park. There are rides for all ages (and levels of bravery) at the park, which has some truly hair-raising roller coasters, interspersed with plenty of gentler rides for smaller children. Youngsters will also love the range of live entertainment on offer: shows include dancing, singing and even Andalusian horses. Speaking of horses, if animals are a big hit with your kids, you’ll definitely want to take a family trip to the Terra Natura Wildlife Park. There are more than 1,500 animals here, including children’s favourites: tigers, monkeys, elephants, snakes, buffalos and rhinos. Try and time your visit to coincide with some of the most popular displays, such as the birds of prey flights or the feeding of the elephants. Next door is the Aqua Natura Water Park, so you could easily spend the day here. The trip out to Benidorm Island on the glass-bottom Aquascope or Aquario boat is always a hit with the kids and will provide you with a great view of the skyscrapers and mountains of the resort. The ride takes around thirty minutes and the little ones will love watching the fish swimming underneath them as you go. No matter where you go this summer, it is important to make sure that you have single trip travel insurance, just in case anything does go wrong. There are a lot of different insurance options out there, but if you are only taking one family holiday this year, then don’t fall in the trap of paying for multiple trips or year-long policies that you won’t use. Single trip travel insurance will cover you from the beginning to the end of your holiday! There are many factors to consider when choosing a ski resort for your family’s winter holiday. With so many options out there how do you narrow it down? The best thing to do is to consider your children’s interests. After all, happy, occupied children generally make for relaxed and happy parents! Fortunately, the trip need not break the bank. Affordable ski travel insurance and self-catered chalets are great ways to keep the costs in check. Here are my favourite top 3 family holiday destinations full of sun, snow and slopes. La Plagne could be said to be the best choice for when you want to keep all your options open. The resorts 10 villages each have their own character and are connected by a vast landscape of intermediate runs. Belle Plagne, Montchavin and Plagne 1800 are popular with families travelling with young children as they each offer unique features such as excellent children’s ski instruction. Montchavin is even traffic-free. Each village has nursery runs and, for more of a challenge, there are numerous intermediate slopes to ski. Travel insurance will obviously cover your equipment and needs in the case of a problem. However, La Plagne’s abundance of age-appropriate activities will keep the children safe and entertained. If a vastly sprawled resort seems a little overwhelming consider the more compact and charming village of Alpbach in Austria. Local accommodation options include friendly pensions and chalet-type hotels, many of which are as close as 20 metres from the nursery slope. For younger children the village is like something out of a fairy-tale. For parents or more seasoned skiers there are excellent off-piste ski options if you know where to look, although the number of intermediate slopes is not vast. Be sure to check that your ski travel insurance covers any adventures that you are planning to take off the beaten track. If you are looking for a holiday that is not limited to one activity, and is off the beaten tourist track, head over to the enchanting resort of Ylläs in Finland. The gentle sloping landscape is ideal for beginner skiers, but the resort’s winning factor, guaranteed to enthral children of any age, are the numerous alternative activities. Snow-shoeing, husky-sledding and reindeer sleigh rides will delight the kids and be a truly unique experience to be remembered. Ylläs is best from the end of March to the end of the ski season. Be warned though, ski travel insurance will not cover the lack of sun during normal daylight hours! Travelling with children, especially young children, is not exactly easy. However, the effort expended will reap huge rewards in creating unique and lasting memories of family togetherness and adventure. Comprehensive ski travel insurance is a must for the ultimate peace of mind. Allowing a child the space and freedom to safely explore, practice (and fall!) is an exhilarating experience for the parent and the child. Choose your resort wisely and the holiday will be a great success for all!